The crimes of king hailesellassie and derg on Eritrean people, The halieselasie statue brings back un-healed wounds. The Eritrean War of Independence was fought as a guerrilla campaign by two main Eritrean liberation fronts, first by the Eritrean Liberation Front (ELF) and then, after the Eritrean Civil War, by the Eritrean People's Liberation Front (EPLF) against the Imperial Army of the Ethiopian Empire, and later by the Marxist Derg. This asymmetrical campaign against Ethiopian control left the Army at a disadvantage and so it embarked on a policy of destroying Eritrean villages. It was hoped that this would prevent the separatists from continuing their campaign. Listed below are some of the major civilian massacres committed by both the Ethiopian Empire and the Derg. 1967-07-24	172	Hazemo	Several villages wiped out and the throats of men slit in front of their wives and children. 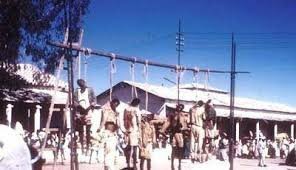 Late 1967	Approx 50	Akordat	Students suspected of being members of the ELF were hanged in the centre of town. Parents of the slain were forced, by the Ethiopian Army, to unhang their dead children and take them home. 1970-01-17	60	Elabared	The village elders were rounded up for supporting the Eritrean Liberation Front and killed. 1970-11-30	120	Basik Dera	The entire village was rounded up into the local mosque and the mosque's doors were locked, the building was then razed and survivors were shot. 1970-12-01	625	Ona	Ethiopian Army units surrounded the village killing civilians and burning down the village. 1974-12-28	45	Asmara	Students were strangled to death using piano strings, their bodies were dumped in alleyways and doorsteps. 1971	Approx 70	Keren	Students and youth suspected of supporting the ELF were publicly executed by hanging. Family members were forced to attend the execution and cut down their children from the noose. 1975-02-14	331-500, 3000	Asmara, Surrounding villages	Shortly after an EPLF attack on two Ethiopian divisions, Ethiopian troops fire upon civilians gathered in Churches, homes and schools. 1975-02-02	80-103	Woki Duba	During an engagement with the EPLF and ELF the Ethiopian Army attacked the church where villagers had taken refuge. 1975-03-09	208	Agordat	After several ELF attacks on the town the Ethiopian Army retaliated on the local population. August 1975	~250	Om Hajer	The villagers were machine gunned in front of a river to prevent escape. April, 1988	3	Agordat	Killed by aerial attacks. 1988-12-05	400+	She'eb	The dead were mostly women and children as the men had moved to the towns to eke out a living for their impoverished village. Throughout the conflict Ethiopia used "anti-personnel gas" and weapons of mass destruction.